WTI prices continue to edge higher reaching a new yearly high of $59.21 per barrel. This surge is supported by the OPEC's decision on Monday after they canceled its planned meeting in April, thereby extending supply cuts first initiated in January and leaving little reason for traders to sell. As for today, a price pullback could be seen if the Energy Information Administration reports a big US inventory build up. 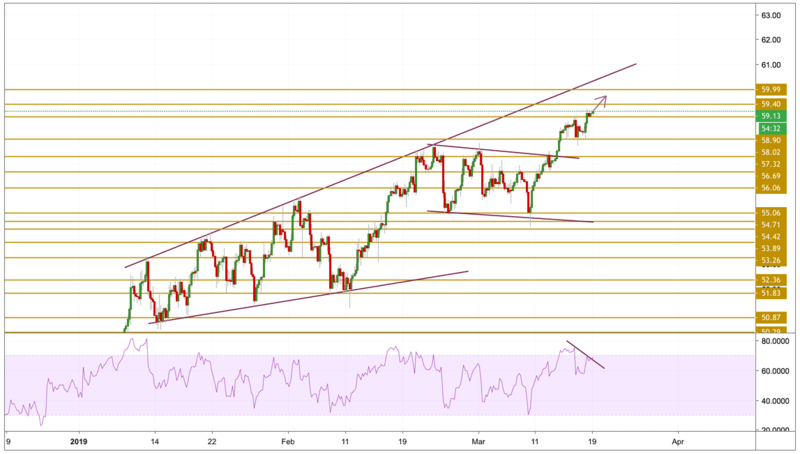 WTI prices are broke to the upside and surged towards a new yearly high of $59.21 per barrel after being capped below the $58.9 resistance level. The price is currently still close to print new highs but there is a big probability that a divergence between the price and the momentum will occur and that would signal a reversal. But for the meantime, we will be focusing on the $59.4 resistance level.